New Orleans fried turkey is just what the name implies, a whole deep fried turkey. This method is used with chicken or with small turkeys. 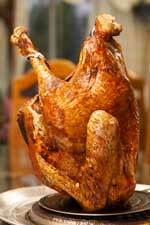 An 8 to 10 pound turkey is stuffed with garlic, onions, peppers and various seasonings and the entire bird is lowered into a huge vat of hot oil and fried until crispy and golden brown.